Ansatsu Kyoushitsu is an anime directed by Angel Beats!’s Seiji Kishi. Its original story comes from Yuusei Matsui’s manga which began in 2012 and is still ongoing in the weekly Shounen Jump magazine. The show will focus on the first meeting and following discoveries of the new Class 3-E. 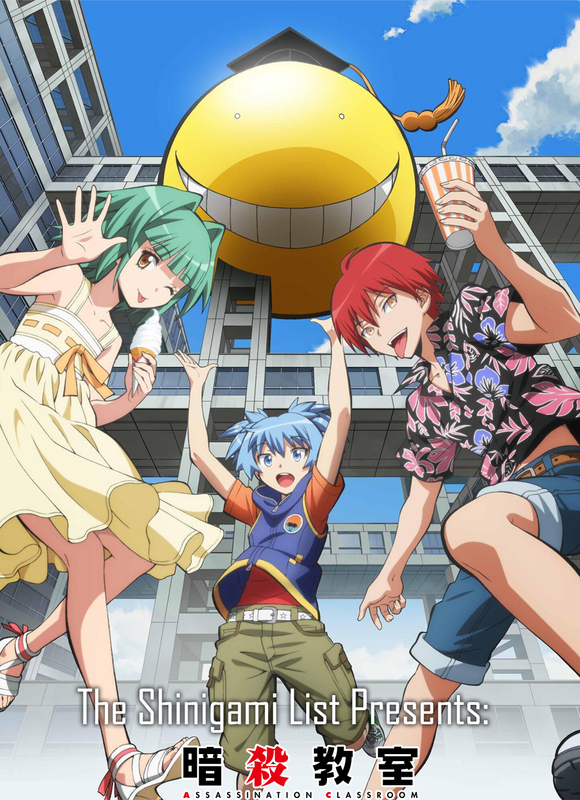 The students will study and train within the walls of the so-called assassination classroom. What will they do and where does this name come from – read on to find out. 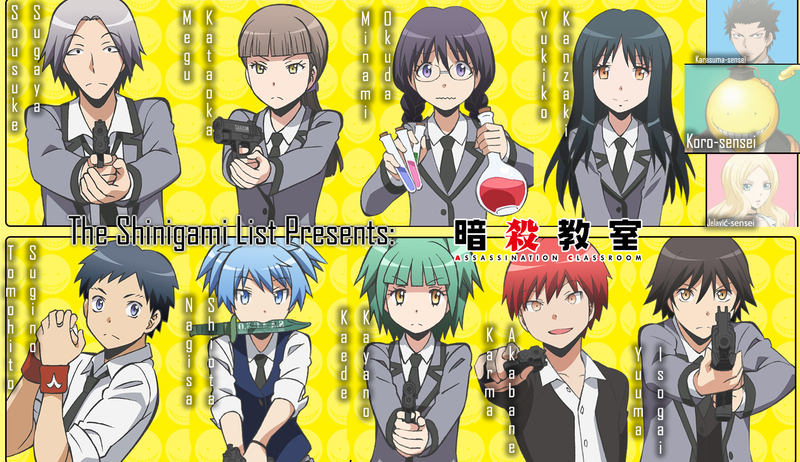 Ansatsu Kyoushitsu (Assassination Classroom) is starting on 9th January 2015. Be ready for some cheeky fun! Koro-sensei is the classroom teacher. He is also the alien life form that is responsible for the current, semi-broken state of the Moon. He is also the one who has to destroy the planet Earth, too. His name comes from the Japanese for “an unkillable teacher” (kurosenai sensei). Playing him is Jun Fukuyama, famous for his roles as Bleach’s Yumichika, Code Geass’s Lelouch and xxxHOLiC’s Watanuki. The second main character in the story is the student Nagisa Shiota. He is the smallest in physics, but when assassination time comes, he is the biggest threat. Because of pure bloodlust, he is able to achieve the only nearly successful attempt at killing the unkillable teacher. Shiota’s seat number used to be 11, but the class is no longer arranged by this. In the show, he will be voiced by Mai Fuchigami. Her past roles include Girls und Panzer’s Miho Nishizumi and Precure!’s Alice Yotsuba. Miss Irina Jelavić is the classroom Languages teacher. She is a lovely blonde, coming from the Slavic region. Her official occupation, however, has nothing to do with the vile and professional hitman she is. Hired by the government, she is in the classroom to assassinate the evil Koro-sensei. In the series, her seiyuu will be Shizuka Itou. Miss Itou’s most notable roles are Beelzebub’s Hildegard, D. Gray-man’s Lenalee and Jormungand’s Koko Hekmatyar. Tadatomi Karasuma is the last character from the main teaching team. He’s the PE coach of Class 3-E, but also a secret agent, sent by the Japanese Ministry of Defence to watch over Koro-sensei and everyone he comes in contact with. As an agent, he is well-respected for being hard to beat and extremely concentrated. His seiyuu will be Tomokazu Sugita. Yes, the one who voiced Gintama’s Gintoki and Terra e…’s Blue Soldier! In Class 3-E there are practically two types of students. The calm and passive ones who are usually support sin the assassination attempts. The proactive students who are always up for a staged assassination and might as well succeed one day. That concept is too cool.